The Newport Gallery Organization will be holding the first Newport Gallery Night of the 2019 season on Thursday, February 14th from 5:00-8:00pm. This will be the 19th Newport Gallery Night season. Newport Gallery Night attendees will be able to spend Valentine’s Day enjoying ​the arts and visiting the participating galleries, museums, and cultural institutions. On February 9th, 2019, the Audrain Automobile Museum opened a new exhibit,Horseless to Horsepower: Gilded and Golden Age Automobiles.​ This exhibit will be open until June 2nd, 2019. The Audrain Automobile Museum is located at ​222 Bellevue Ave, Newport, RI 02840. Spring Bull Gallery is once again presenting its ​Fakes & Forgeries​ exhibit. 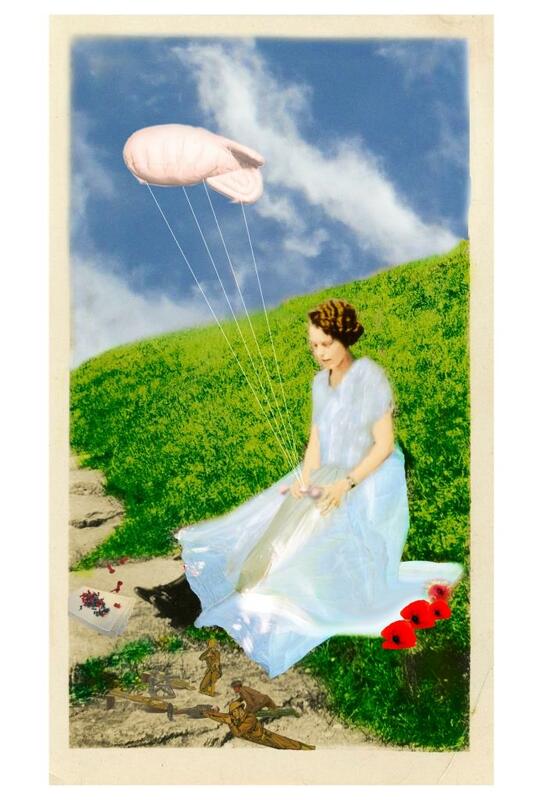 Artists create both serious copies or remakes of famous works of art with their own personal twist. This show will run until February 28th, 2019. Spring Bull Gallery is located at 55 Bellevue Ave, Newport, RI 02840. The Coastal Contemporary Gallery will be presenting ​‘Sea Change,’ A Social, Environmental & Globally Conscious Art Exhibition Featuring Scott Lapham and Joan Wyand f​rom March 6th through 30th, 2019. Discounts for 7 Newport restaurants and establishments will be available upon attending Newport Gallery Night.​ ​Free parking is available at the Gateway Visitors Center and uptown at the Newport Art Museum. Newport Gallery Organization is a collection of over 25 participating galleries in Newport. For more information about Newport Gallery Night, Free Guided Walking Tours, and the Newport Gallery Organization, visit www.newportgallerynight.com. This November, enjoy the cool air on November Newport Gallery Night which will take place on November 8, 2018 from 5:00 to 8:00 pm. Deblois Gallery is featuring “Small Works, Big Ideas”, an open show and pre-holiday art mart. Coastal Contemporary Gallery is hosting “UNRAVEL”, an exhibit showcasing fine art, fashion and music. Spring Bull Gallery will be featuring the 27th Annual Les Petites Oeuvres Exhibition, an annual showcase of small artistic treasures in oils, watercolors, pastels, graphics, welded metal sculptures, stoneware and other media. Highlights at some of the other member galleries include Sheldon Fine Art, showcasing modern marine artist Ken Zier and Atelier Gallery’s latest show “Dark Matter”, a two-person exhibition featuring Jemison Faust and Jason Chase. Newport Art Museum will be presenting its latest film by international artist Shirin Neshat for its “Art After Dark” event from 5 to 9pm. If you’re hungry after all these exhibitions, step into one of the 6 restaurants that collaborate with Newport Gallery Organization by providing discounts and specials for Newport Gallery Night visitors! Be sure to ask for a restaurant coupon and a parking voucher at any of the galleries. Free parking will be available for the night at the Gateway Visitors Center with a parking voucher and uptown at the Newport Art Museum. This October, enjoy the cool air on Newport Gallery Night. Newport Gallery Night will take place on October 11, 2018 from 4:00 to 8:00 pm. The last FREE guided walking tours of the year will be happening (weather permitting). There will be four separate walking tours meeting at 4:00 pm at Thames Glass, 5:00 pm at Spring Bull Gallery, 6:00 pm at Art on Springand 7:00 pm at Arnold Art Gallery. Spring Bull Galleryis featuring members of the Hoyt family; Kate Hoyt Psaki, Jane Hoyt DelRose and William B. Hoyt in“A Family Affair”. The exhibit runs through October 31, 2018. DeBlois Galleryis showcasing “LOST and FOUND-reclamation and celebration” through October 28th. 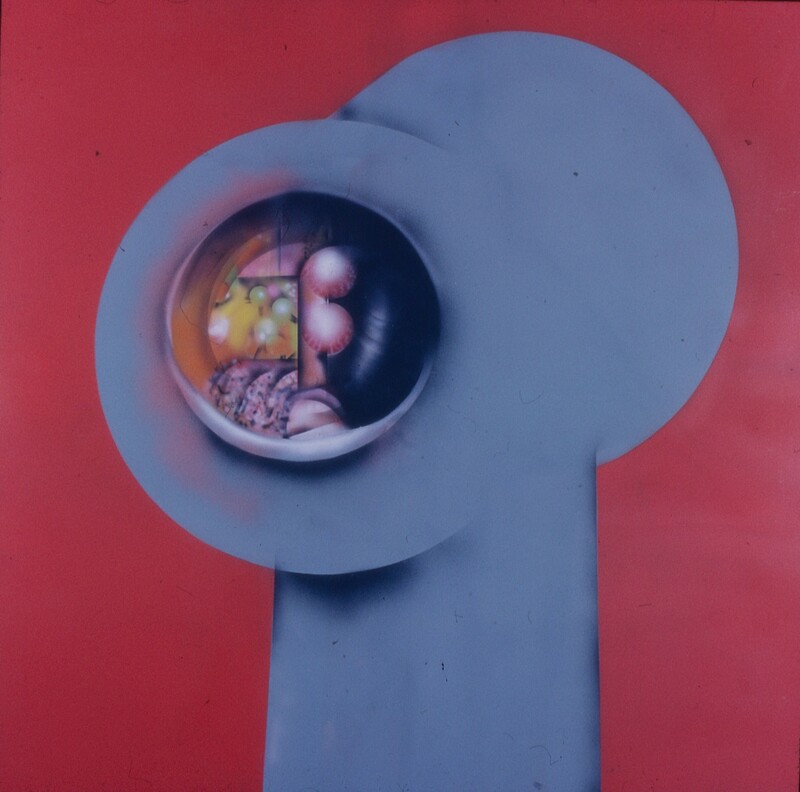 The artists involved in this mixed media exhibition include Bert Katz (1934-2012) whose paintings and drawings are on display as well as R.L. Stetson who works with unique wood and wire sculptures. 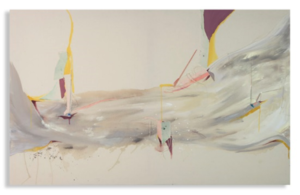 Coastal Contemporary Galleryis excited to feature ‘PROJECTIVE PLANES’. The artists’ Gent and Schmitt explore multiple levels of planes, fusing color and texture within the two and three-dimensional forms that they construct. The exhibit ends November 5, 2018. 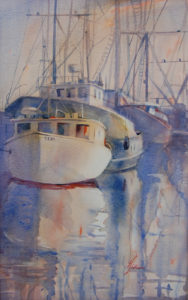 Other highlights for October Newport Gallery Night include Sheldon Fine Art, showcasing “Calm Reflections”. Soothing seascapes painted by Leslie Berenson. Atelier Galleryis featuring “Pace of Nature” through October 14th. 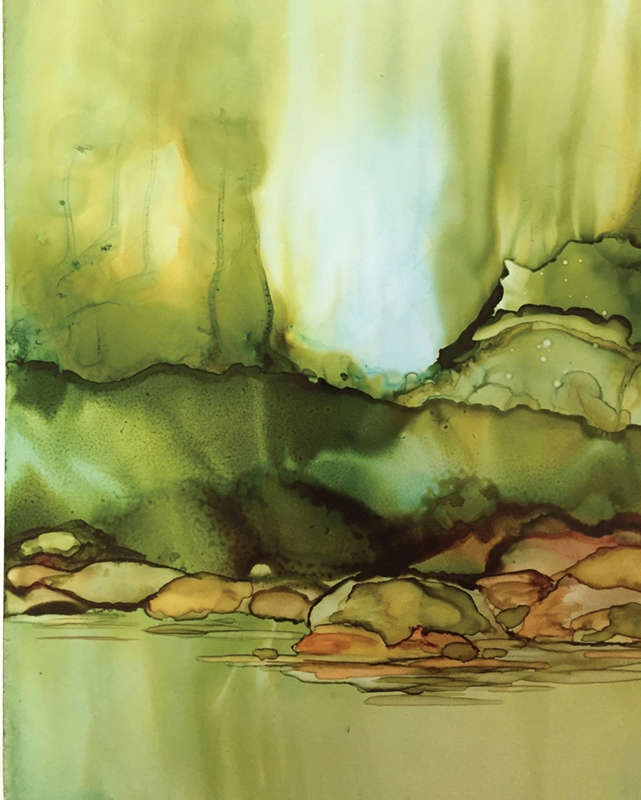 The artists Mary Dondero, Richard Nocera and Jeff Soderbergh work in different mediums and share a slow pace of nature in common in their process to make work. Our newest gallery is D. Chatowsky Art Gallerylocated on the corner of Spring and Touro streets at 60 Spring Street. Chatowsky has created a space for ten local artists to showcase artwork along with a boutique offering unique items. For more information about Newport Gallery Night, our Free Guided Walking Tours and the Newport Gallery Organization, visit www.newportgalleries.org. Newport Galleries Night 2018 is underway and the season is in high gear at our member galleries, museums and cultural institutions with August Newport Gallery Night on Thursday, September 13th from 4:00 pm until 8:00 pm. Our popular FREE Summer Guided Walking Art Tours continue for September Newport Gallery Night. And these short, informational tours will run hourly as follows: meeting at 4:00 pm at Thames Glass, 5:00 pm at Spring Bull Gallery, 6:00 pm at Art on Spring and 7:00 pm at Arnold Art Gallery. Tours, which will last about 30-45 minutes, will include information about all of the participating galleries, museums and cultural institutions in each area as well as any other interesting art related stories. The tours will run on Newport Gallery Nights from May through October. There are exciting new shows at many of the 28 member galleries, museums and cultural institutions including: Atelier, Spring Bull Gallery, DeBlois Gallery, Coastal Contemporary Gallery, andCory Silken Photography. If you’re hungry after all these exhibitions, step into one of the 7 restaurants that collaborate with Newport Gallery Organization by providing discounts and specials for Newport Gallery Night visitors! Be sure to ask for a restaurant coupon and a parking voucher at any of the galleries.Free parking will be available for the night at the Gateway Visitors Center with a parking voucher and uptown at the Newport Art Museum. For more information about Newport Gallery Night, our Free Guided Walking Tours and the Newport Gallery Organization, visit http://www.newportgalleries.org. This May, soak up the warm weather on gallery night and enjoy the world class sailing event, Volvo Ocean Race. Gallery night will take place on May 10, 2018 from 4:00 to 8:00 pm. FREE guided walking tours will be happening (weather permitting). There will be four separate walking tours meeting at 4:00 pm at Thames Glass, 5:00 pm at Spring Bull Gallery, 6:00 pm at Art on Spring and 7:00 pm at Arnold Art Gallery. 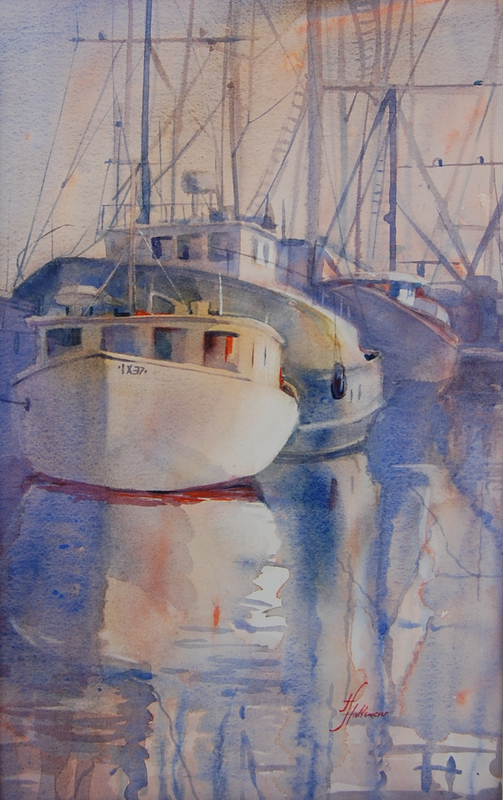 Spring Bull Gallery is proud to feature thirteen artists from the Westport Art Group organization with an opening reception on Saturday, May 5th from 5:00 to 7:00 pm un May 31st. . During gallery night they will have a painting demonstration from one of the Spring Bull Gallery members. DeBlois Gallery is excited to showcase “Deep Currents” from May 5th to May 27th. The artists involved in this mixed media exhibition include Liz Abbott, Marilyn Moriarty, Timothy Michael Hetland. Liz Abbott, an artist and printmaker, creates sand collagraphs, a method with glue, sand and printing. Marilyn Moriarty works with watercolor on Asian rice paper. Timothy Hetland’s creations are metal art fabrications that combine stone and wood. Be sure to check out the Volvo Ocean Race while walking around town. The Race Village Opening Ceremony will open on May 8th. On gallery night, May 10th, the Race Village will be open from 10:00 am to 7:00 pm. If you’re hungry after all these exhibitions, step into one of the 6 restaurants that collaborate with Newport Gallery Organization by providing discounts and specials for Newport Gallery Night visitors! Free parking will be available for the night at the Gateway Visitors Center and uptown at the Newport Art Museum. Enjoy the Spring weather by walking around town to see the latest exhibitions as the ever popular FREE guided walking art tours return for April Newport Gallery Night (weather permitting) on Thursday, April 12th, 2018 from 4:00 – 8:00 pm featuring participating member galleries, museums and cultural institutions including five new galleries. There will be four separate walking tours meeting at 4:00 pm at Thames Glass, 5:00 pm at Spring Bull Gallery, 6:00 pm at Art on Spring and 7:00 pm at Arnold Art Gallery. Andrea S. Keogh Art and Design, a new gallery at 59 Bellevue Avenue, is featuring the exhibit “Seeing Red” from April 1st until June 1st. 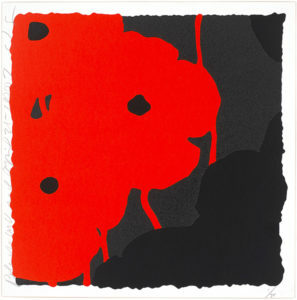 Each of the works are from different periods, however, the unifying theme of the collection is the color red, including fiery red pieces like Donald Sultan’s two prints, Red and Black and Black and Red. The way he uses the plane and experiments with lithography creates a work of art that is simultaneously representational and abstract. Newport Art Museum will be hosting “Art After Dark” on gallery night. The gallery talk consists of domestic affairs: “Domesticity, Identity, and the Home” with Francine Weiss, Senior Curator. It will also include an education event, featuring presentations from six teaching artists. 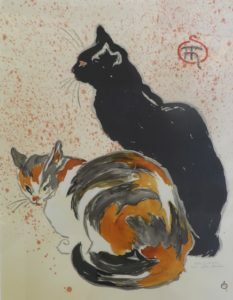 Roger King Fine Arts on Spring Street offers a diverse array of paintings by 19th and 20th century artists including African-American art, cityscapes, figurative and genre, landscape, marine and coastal scenes, still life, and modernist art. Beautiful new additions of summer scenes include Charles Woodbury’s Ocean View near Perkins Cove, Oqunquit Maine from 1911 and Mabel May Woodward’s Young Boy String Fishing. Newport Contemporary Fine Arts, located at Goddard Row, Brick Marketplace, will be hosting an opening for their spring exhibition on April Newport Gallery Night at 7:00pm. Featured artists will be Jessica Dean Rosner – Ink on Paper, Meredith Morten – Ceramics, and Peter Cohen – Sculptures. 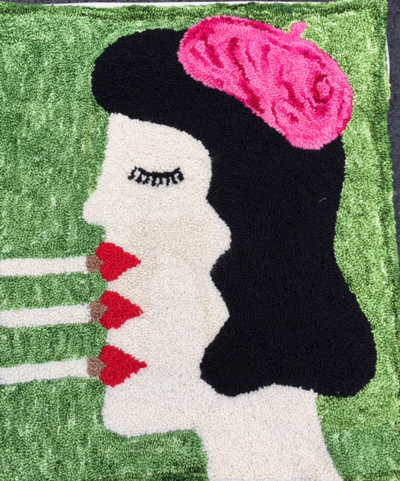 Start off your Spring by getting out to see the latest exhibitions around town. The Newport Gallery Organization is hosting Newport Gallery Night on March 8th, 2018 from 5:00 – 8:00 pm at participating member galleries, museums and cultural institutions. If you’re feeling festive for St. Patrick’s Day, you’ll definitely want to check out Spring Bull Gallery’s upcoming exhibit “Irish Eyes: An Artistic Celebration of Irish Heritage” opening on March 3 from 5:oo pm – 7:00 pm. This celebration of Irish heritage with landscapes, quaint cottages, castles, and all the hues of lush vegetation in Ireland continues through to April 3. There are a number of exciting exhibits commencing the start of Spring. DeBlois Gallery is showcasing their 2018 kickoff open show “Anything Goes” on Saturday March 3, 2018 with a reception from 5:00pm – 7:00pm. The exhibit runs from March 3 to March 25, 2018. “Art After Dark” at the Newport Art Museum is another popular event on Newport Gallery Night. On Bellevue Avenue, Atelier Gallery is continuing their revolving exhibition featuring residents artists and friends “Hearths & Hideaways” until March 25th. The Newport Art Museum “Art After Dark” features artful programs, talks, film screenings, gallery games, music and drinks. This month also features the opening reception for the Youth Art Month exhibition in the Coleman Center from 4:00 – 6:00pm. This show opens on Saturday, March 8, 2018 with a reception from 5:00pm – 9:00pm, and takes place on the second Thursday of each month. “Anything Goes” at DeBlois Gallery showcases playwright and satirist Noel Coward. He aims for the funnybone, with the craziness, and excesses of the 30’s. DeBlois opted to find the same impulses in our own era for the open show theme: “Anything Goes.” To find out how the community- near and far- have developed this idea in many mediums. The show runs until on March 25. For more information about Newport Gallery Night and Newport Gallery Organization, visit http://www.newportgalleries.org. A new year means a new season of Newport Gallery Night events. The Newport Gallery Organization kicks off its 18th season with February Newport Gallery Night on Thursday, February 8, 2018 from 5:00 pm – 8:00 pm at participating galleries, museums and cultural institutions. As the winter weather becomes milder, it’s the perfect time to experience the art around Newport. Make a night of it by exploring the arts and visiting a selection of the participating galleries, museums, and cultural institutions. 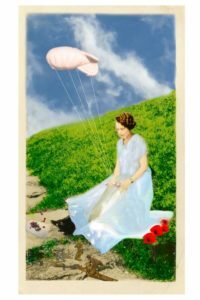 This month marks the opening of several exciting exhibits including the following: Spring Bull Gallery commences their annual Fakes & Forgeries exhibit on Saturday February 3, 2018 with a reception from 5:00pm – 7:00pm. 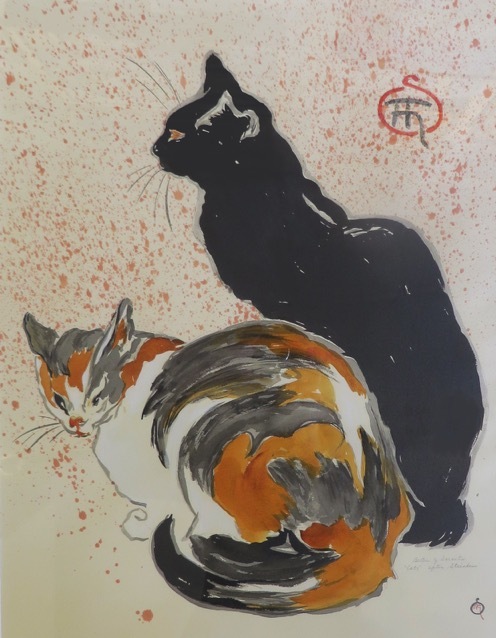 The much anticipated show features serious “copies” and humorous interpretations of well-known artwork, all submitted by local artists and created in a variety of forms and styles. The public will have a chance to observe or own an “almost masterpiece” without traveling far. A guest judge will select the “Best in Show” and gallery visitors will get to vote for their favorite piece throughout the month for a “People’s Choice Award.” The exhibit runs from February 3 to February 28, 2018. Nearby, on Thames Street, Blink Gallery has collected over twenty fantastic pieces that were not selected for the Newport Annual Juried Show and will instead feature them in their Salon de Refusés exhibit. This exhibit highlights diversity through pieces that have a common thread. The gallery will be hung in traditional Salon style and showcases an eclectic mix of subjects, styles and sizes. The show opens on Saturday, February 3, 2018 with a reception from 7:00pm – 9:00pm, and will run until February 19th. If you’re feeling cold after visiting all these exhibitions, step into one of the 6 restaurants that collaborate with Newport Gallery Organization by providing discounts and specials for Gallery Night visitors! Free parking is available for the night at the Gateway Visitors Center and uptown at the Newport Art Museum. For more information about Newport Gallery Night and the Newport Gallery Organization, visit http://www.newportgalleries.org. December Newport Gallery Night, sponsored by the Newport Gallery Organization, will take place on Thursday, December 14th from 5:00 p.m. to 8:00 p.m. During this evening, visitors can explore the 28 participating galleries, museums and cultural institutions that Newport has to offer. These galleries will be open for viewing during Gallery Night hours and visitors can purchase contemporary, historic, traditional and avant-garde pieces sales tax free in Newport, just in time for the holidays. This December’s Newport Gallery Night will feature several fine arts and crafts exhibits to kick off holiday shopping. Spring Bull Gallery will hold its 27th annual “Les Petites Oeuvres” exhibition, where Gallery Night visitors can shop for the holidays by purchasing a small artistic gem from a local artist. This exhibit will be on display until December 31st. Artist Susan Shaw, whose work is featured in the “Les Petites Oeuvres” exhibition, will also be doing a demo on Gallery Night. Visitors can continue their holiday shopping at DeBlois Gallery, where they can purchase fine art, soaps, ornaments, handcrafted clothing, photography, toys and more at the “Deck the Halls (and the Walls)” fine arts and crafts show, on display until December 24th. Lastly, the Newport Art Museum will begin its faculty and student holiday arts and crafts sale on Gallery Night, which will continue December 15th and 16th. Newport Art Museum is also encouraging people to give the gift of membership this holiday season, which includes free admission to the museum and discounts on many museum offerings and events. 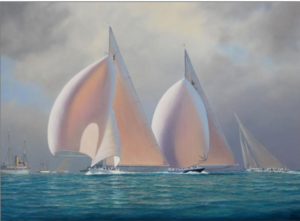 Sheldon Fine Art will display maritime painter Tim Thompson’s “Ranger and Endeavour II” during Gallery Night. This will be the only place to view the large-scale piece in person before it is sold to a private collector. Complete Gallery Night by visiting one of the many restaurants in Newport that collaborate with the Newport Gallery Organization. Restaurants such as Sardella’s, The Spiced Pear and Mamma Luisa participate by providing discounts and specials for all Gallery Night visitors. Be sure to ask for a voucher at any of the galleries. Free parking is available at the Gateway Visitors Center and the Newport Art Museum. Aquidneck Avenue, Middletown, near First Beach. Free. Refreshments.